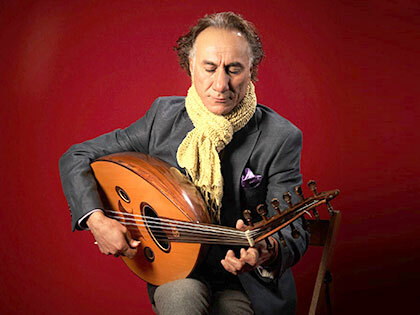 Join Hancher's Micah Ariel James and Chuy Renteria for a conversation with virtuoso oud musician and composer Rahim AlHaj about the role that art and music have played in his life throughout his years as an Iraqi, a political refugee, and now an American citizen. Hancher’s Embracing Complexity project takes a multidisciplinary and collaborative approach to building understanding of contemporary Islamic cultures and Muslim identity. In 1991, after the first Gulf War, AlHaj was forced to leave Iraq due to his activism against the Saddam Hussein regime and he began his life in Jordan and Syria. He moved to the US in 2000 as a political refugee and has resided in Albuquerque, NM, ever since. AlHaj has released ten albums, delicately combining traditional Iraqi maqams with contemporary styling and influence. His compositions evoke the experience of exile from his homeland and of new beginnings in his adopted country.